Discussion in 'Traditional Folders and Fixed Blades' started by eisman, Jul 15, 2018. I didn’t notice but is Buck going to add a variation of our pattern to their existing lineup? Where did you see this? Thanks. Maybe it's been asked before and I missed it... 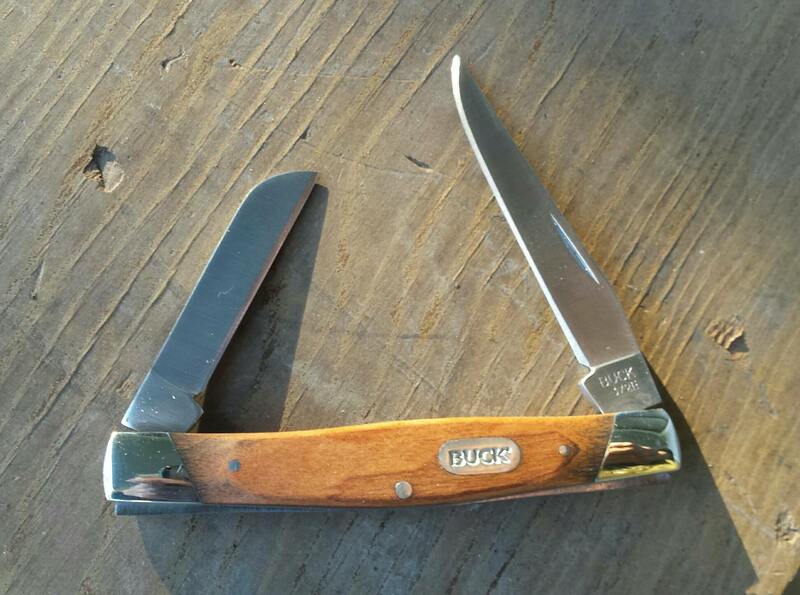 But has Buck ever produced a two bladed 301 before this? I asked on the tour and they didn't know for sure, but didn't think so. I think I recall someone saying that there has never been a two bladed 301 but I'm not sure either. The 302 Solitaire was on the same frame as the 301 but it's a single blade. Was the one year we didn’t get the knife till after January IIRC. That only happened once though. You folks gettin’ their first forum knife this year have reaped the benefits of members like Gus (Bastid), Blues (Elliot) and a host of others who had invested everything from time, blood and sweat to get us a knife and continue the tradition. Even the price has come down to the point where the last few knives had been under the $100 mark by a substantial amount. Without all the efforts of the past volunteers and the enormous effort and time Stephen has put into bringing us yet another gorgeous annual knife for the fine folks of the porch and the traditional forum. I remember struggling to get 50 people interested in an annual knife for us. I think it was harder getting 50 people back in the day to agree on a knife than it was getting 500 people today. Back then everyone wanted what they wanted, today it’s easier to see the trend 500 are leaning towards than to see a trend in what 50 wanted. Stephen, enjoy the baby, family first, speaking for myself and most here I’m sure, we won’t die if it takes a little longer to get them out the door to us. Fodderwing and meako like this. I was under the Impression they were done, packed and on their way! btb01, sitflyer and Prester John like this. my lederhosen are still at the drycleaners. r8shell and Prester John like this. afishhunter, knowtracks, TFBraden and 7 others like this. Close, but I wouldn't count it: it's not a 301, and I believe it's a little shorter. Well, it's a lot easier for folks like me who placed their order and then took a break from the forum, whenever it is finished it will just show up one day out of the blue. How a y'all been doin' roundabout these parts? afishhunter, Ratbert, Jack Black and 2 others like this. Until the results of the poll are tabulated, I'm not quite sure. sunnyd, meako, 1066vik and 4 others like this. Not as a standard pattern for sure. Don't think they had any special runs, either. But, @300Bucks would be the one to ask. sunnyd and Fixall like this. marcus52AR, sunnyd, Elgatodeacero and 1 other person like this. I also ordered only one without the slip. Figured if I am going to carry it, it will just go into the pocket like any other slippie. But now I also have thoughts about the "only one choice" that I made. It's okay really. Not going to sell or give away mine, at least no plans along that line. I'll probably still have it when I die. Somebody will say..... an old Buck knife.... big deal right? As before, I tend to check this thread weekly and wonder what the status is on the build. Doesn't really matter, just curious. I used the exact same reasoning when I ordered a single knife with no slip, lol. Mine will DEFINITELY be carried... Which is probably why I should have ordered two. I imagine I'll be pretty devastated if I lose or damage the one I ordered. I would like to say that I WILL carry mine. But I'll wait until I get it. Most of my GEC's have not been carried at all because I am in such a rut when it comes to my regular EDC's. There's the 111mm SAK and then there is the other knife..... it could be the "other knife" or it could replace the SAK. I use either the flat head or philips head just about weekly for something..... the last was replacing some batteries in a little light that had screws to open it up. I'll be pleased if I get this sweet little Buck by Christmas and of coarse she'll be going directly into my right front pocket to be used. I'm looking forward with excited anticipation to putting her through my edc paces. marcus52AR, rye_a and Jolipapa like this. I have two on the way. One will go into my EDC rotation, and the other will be added to the knives I've set aside to be gifted to my son, daughter, or one of my friends. I really enjoy sharing the joy of quality traditional knives. Laurelbb, madcap_magician, sunnyd and 1 other person like this. Cutfinger, afishhunter, dirc and 54 others like this. Me, too. 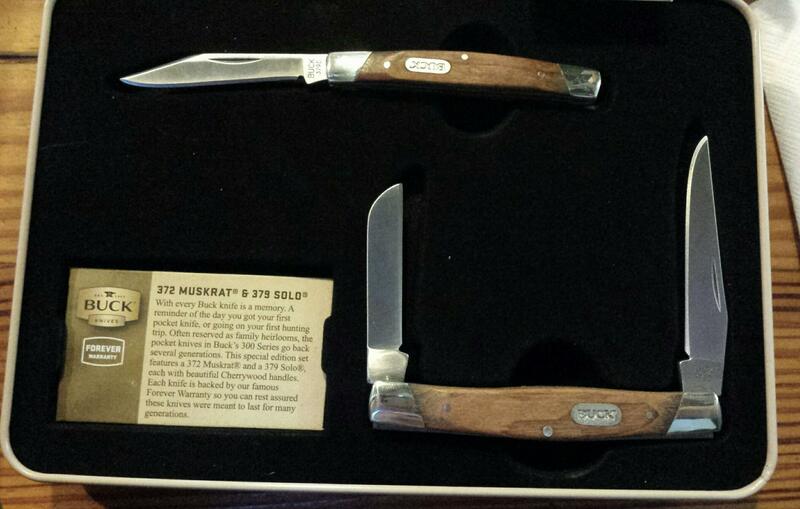 For some reason the two knives I give away are Spyderco Delicas... And traditional slipjoints.